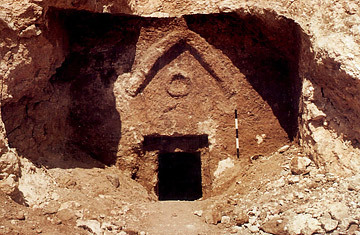 You may or may not have heard about the so-called Jesus tomb. This is a tomb that was discovered in the Talpiot neighborhood of Jerusalem where a housing project was being constructed. In 2007 the Discovery Channel produced a show in which the "archaeologists" claimed that it was the family tomb of Jesus and that one of the ossuaires may have contained the bones of Jesus. You can read more about that tomb on the Discovery Channel website. The reaction from the scholarly world was one of extreme skepticism. Virtually no one not connected to the project thought this was the family tomb of Jesus. Their opinions were not based on some desire to preserve the authenticity of the gospel accounts of Jesus resurrection. Rather, their response was based on the shoddy methods used and the flimsy conclusions reached by the producers of the Jesus Tomb show. While the people who produced this show should have simply cashed in their winnings and went away, they did not. They are back and this time with claims that they have discovered another tomb nearby which contains the remains of early followers of Jesus. And this too will be another episode of pseudo history and archaeology aired tonight on the Discovery Channel. The central feature of this episode will be another ossuary with what the show's producers are claiming is a fish, a symbol of Christian iconography, or Jonah's whale. If it is a fish it is the oddest looking fish. I have avoided any discussion of this topic until now. I did not think that it was worth giving these claims any attention, and a number of my colleagues have done a fine job pointing out the flaws in the claim. But the show will run tonight and I thought it might be good to alert interested readers to the fact that there are many who do not think the conclusions that will be presented in the show can be sustained. Below is a short video clip that appeared on ABC News on Tuesday. In the clip you will see my New Testament colleague and fellow blogger Mark Goodacre. Mark teaches at Duke University and was asked to respond to the claims being made by the show. He was involved with helping to dispel the producers claims about the so-called Jesus tomb, and has been adding his voice again to the debate. I think you will find that Mark has a much more responsible approach. Update: Since I posted this Mark Goodacre has posted a Summary of the "Jesus Discovery" and the Top Ten Problems with it. Not to be outdone is a response by James Tabor to Mark's post at the Tabor Blog. Also, below the ABC News clip is one of Bob Cargill on CNN this morning. Bob also presents the reasons we are all skeptical. One must keep in mind that this tomb is of an historical Torah observant Jew, as opposed to the syncretism that was perpetrated after his death that has come to be known J*e*s*u*s. Keeping this in mind, the statement that, "virtually no one not connected to the project thought this was the family tomb of Jesus. Their opinions were not based on some desire to preserve the authenticity of the gospel accounts of Jesus resurrection. Rather, their response was based on the shoddy methods used and the flimsy conclusions reached by the producers of the Jesus Tomb show," is completely inaccurate. Just the opposite. The opinions were almost without exception a desire to preserve the status quo. One could easily conjecture had Talpiot Tomb (A) been found during the Inquisition, that heads would have literally rolled, to suppress this scientific find. Were Adam and Eve Cavemen?